Are you an employer seeking to improve employee wellness and company morale? Do you want to lower employee stress and increase focus and productivity? Would you like to reduce your overall employee benefit costs? Perhaps you’ve heard about the success companies have found offering mindfulness meditation and yoga to employees, and you want to achieve similar increased performance within your company. Or, maybe you really care about the wellbeing of your employees and want to provide them with an office environment that they love, rave about and benefit from. Essentially, are you looking for an effective, proven way to help your employees feel less stressed, more focused and happier at work and beyond? Corporate leaders have focused on building and funding robust worksite wellness programs. According to a 2013 survey by the RAND Corporation, over half of U.S. employers offer wellness program incentives, and larger employers are likely to have more complex wellness programs. Seventy-two percent of those offering wellness programs include a combination of screening activities and interventions. Participating employees are offered financial incentives, at an estimated annual cost of nearly $600 per employee. The most popular wellness programs continue to be focused on lifestyle management, such as physical activity programs, weight management programs and stress management. Other popular health improvement options include disease/care management programs (e.g., managing chronic health conditions, like diabetes), lifestyle-management services (e.g., weight loss advice, gym membership discounts), health-risk management services (e.g., on-site flu shots) and environmental enhancements (e.g., bike racks, walking paths). In the midst of all this spending, employee benefit costs continue to rise, and employee engagement continues to decline. Employee wellness programs are not measuring what matters. Gallup (2015) reports that 70 percent of employees are disengaged, which leads to lower productivity, innovation and well-being. Only 8 percent of employees strongly agree that their job leads to feelings of overall well-being. If worksite wellness programs were effective, these statistics would be different. So, what is the best investment for your organization? Stress costs American companies between $200 billion and $300 billion in lost productivity each year. Research shows that mindfulness can not only decrease stress, but also improve sleep and boost empathy, creativity and focus. These findings have prompted companies, including innovative global leaders like Google, Aetna, GE, Ford Motors and American Express, to provide their employees with mindfulness in the workplace training. And, the investment pays off. Employees utilizing their companies’ mindfulness training are reporting stress reduction, improved sleep and increased productivity each week. Happier, well-rested and more focused employees aren’t the only benefit. Implementing wellness programs is making these companies even wealthier. In fact, data provided by Aetna shows that the employees utilizing provided mindfulness training and onsite yoga classes are gaining the company $3,000 per employee a year. Given the many benefits of mindfulness, it’s no surprise that more and more companies—both large and small—are offering onsite mindfulness in the workplace training and instruction to their employees. In addition to decreasing stress and improving sleep and focus, mindfulness helps people become less reactionary and more responsive; engage in thoughtful, effective communication; mitigate distractions like social media use; set and achieve both personal and professional goals; and feel balanced, centered and grounded. It has also been shown to improve immune functioning, which leads to less sick days and happier, healthier people in the workplace. 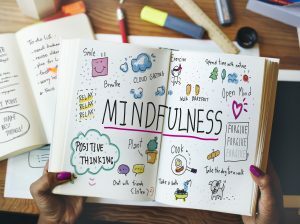 With mindfulness programs springing up all over the country, it can be challenging to know which program to choose and/or how to implement mindfulness into your workplace environment, especially if your budget can’t support a costly program. The good news is that you don’t have to spend a fortune or dive into a full-scale, employee-based mindfulness program. I can develop a program that works for your company and help you take employee performance, productivity and wellbeing to the next level. Mindfulness takes a short time to learn, but a long time to master. Like getting good at anything, the practice requires, well, practice. But, it is doable. And, we’re now finally seeing studies and statistics that support what practitioners of this ancient practice have known for centuries: mindfulness works. Whether you’re looking for workshops, mindful leadership coaching or a simple, effective presentation on mindfulness, its benefits and how to practice it, I can help. I’ve been providing mindfulness-based psychotherapy and stress management consulting for more than a decade and have helped multiple companies develop mindfulness-based wellness programs. I’ve also facilitated a variety of workshops, presentations and professional trainings on how to implement the practice into both personal lives and the professional sphere to identify, foster and achieve goals. Simply knowing breath management techniques and having a better understanding of stress can help build resilience. Resilience improves health, and saves company money. Contact Lisa Schmidt, MS, CEBS, Mindfulness Consultant and expert in employee worksite wellness programs for more information on how your company can be forward thinking, competitive, smart and focused on measuring what matters – a healthier, higher performing, stress resilient workforce. I invite you to call for a phone consultation to discuss your company’s specific needs and goals. I am happy to answer any questions you have about mindfulness in the workplace and how to best incorporate mindfulness training and practice into your company’s culture.